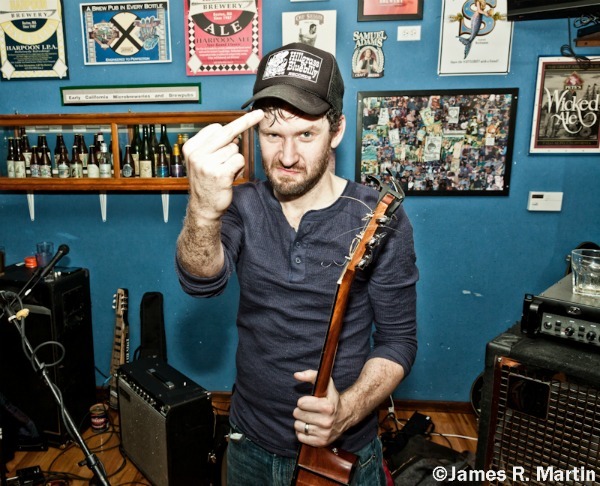 This ornery lookin’ cuss is Leroy Virgil, lead singer of Reno, NV-based Hellbound Glory, who make real good bare knuckled country music. Their latest album, Damaged Goods, is a rowdy keeper full of fight – literal and figurative – with songs about drunk mamas, lost causes and other meaty subject matter for men to get into. Plenty of conviction in this Bird. We get the sense it ain’t the first time he’s raised that finger…Thanks to James R. Martin for taking this shot.